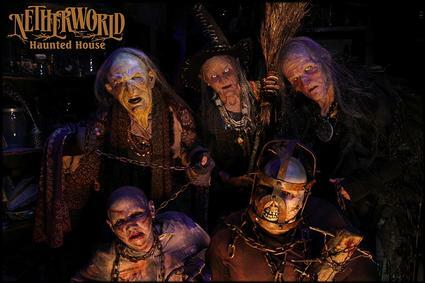 Netherworld is a self-guided, dark attraction known for its over-the-top special effects, intense make-up, costuming and stunt actors as well as unique monsters, unusual themes and chilling detail. Every night the attraction is open, over 100 actors are transformed into monsters to scare and entertain the guests. Some perform stunts such as bungee jumps and sliding. Many visitors enjoy the actors disguised as nightmarish creatures that stalk the parking lot before the haunted house actually begins, starting the experience the moment guests get out of their cars. Also new for Netherworld in 2017 is the introduction of their new Escape Games located at Netherworld's future Stone Mountain location, they are open and booking now. With game themes like Sasquatch, Nosferatu and Haunted, you can safely expect the same high level of detail and fun that Netherworld has been serving up at their haunted houses for over 20 years. Visit the website at www.ESCAPETHENETHERWORLD.com to learn more. 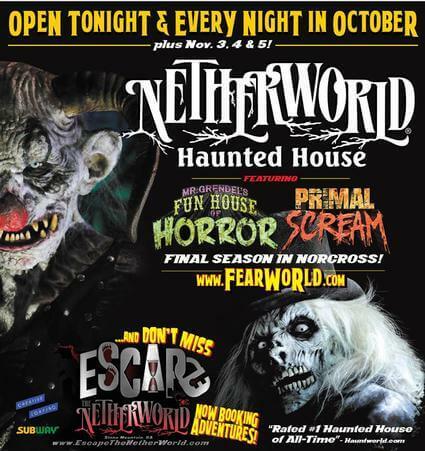 Since it began 21 years ago, Netherworld has been voted by industry peers such as USA Today, Hauntworld Magazine,Dread Central, Fangoria and AOL as one of the top haunts in the nation.